50% off plus FREE SHIPPING for a limited time! 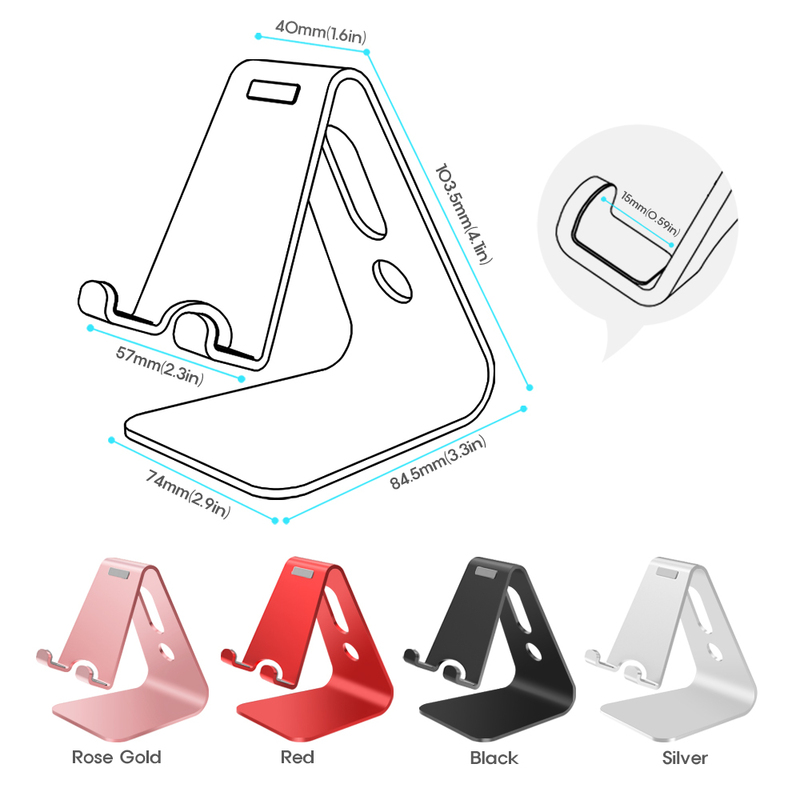 This great universal smartphone stand is ideal for any smartphone or tablet. You can make you smartphone hands free, perfect for Face-time, watching You tube at your desk or as an alarm clock. This list is endless. The Vogek Smart Phone stand is hands free and perfectly angled. Hands-free , makes it so easy to read message and emails. Its low center of gravity makes it stable. 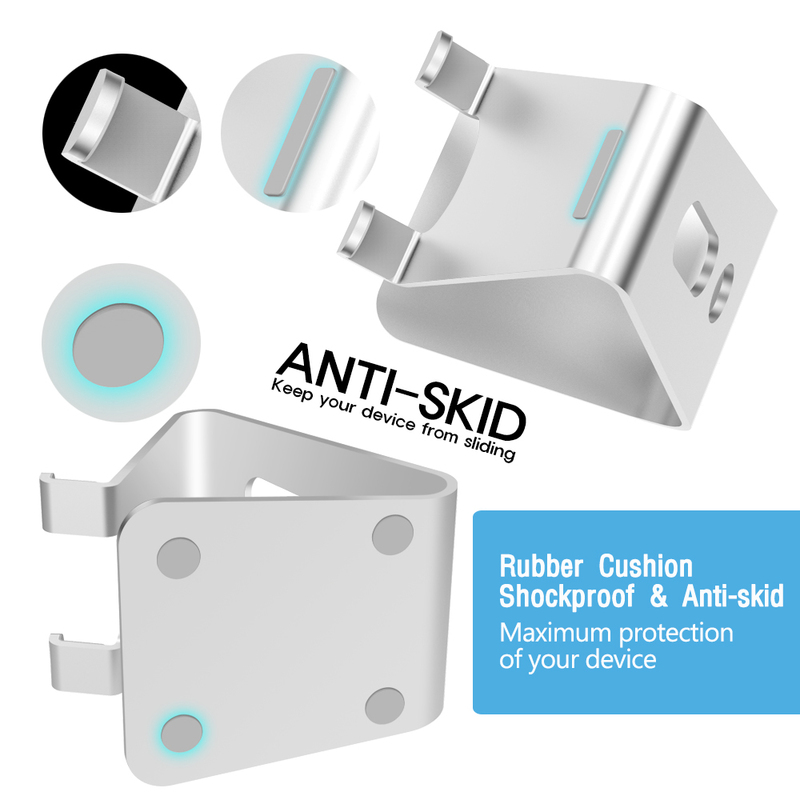 Extended hooks keep the phone safe and rubber cushions protect the phone from scratches and sliding. Works with your smart phones. Orders will be processed within 1 business days of ordering and shipped out the next day. Safe and easy payments via Stripe® - All Major Credit/ Debit Cards Accepted! If you rely a great deal on your smartphone, you need this stand. Just add a small, packable Bluetooth keyboard and mouse, and you'll be set. Combined with a small Bluetooth keyboard and mouse, I now have a far more portable and flexible laptop/tablet replacement. The stand has a small footprint, so it works well where space is limited. And it packs so much better than a laptop or even a tablet that I anticipate using this new setup most often. Brilliant product! And well made. I bought two, and they make using our smartphones (Motorola Droid Turbo, and Samsung S5) so much more convenient to use on a kitchen countertop, workbench, desk or table. Love this thing! Don't know how I lived without it until now! I am able to set my phone up with a charger attached near my work area in my kitchen, or near my seated coffee break and sewing machine work area, and it is so convenient to be able to see the screen directly without having to reach over and pick up the phone! Very sturdy built out of some type of heavy metal and I'm sure it's going to last for years and years. Folds up into a convenient shape for traveling. I am actually thinking about ordering several more for Christmas gifts. Thank you, Lamicall, for making such a great product! This is awesome! it holds my phone, which is a Samsung Galaxy S6 with the case on, which is an Otter box. I can't wait to use it at work, which is why I ordered it. Right now I'm using it on the table next to my recliner in my living room and I'm going to try it on my night stand. I'm planning on buying two more so I can use them at home and leave this one at work! I'm very happy with this purchase. If you are like me and use your cell phone more then your computer then you need this! I bought two cell phone covers with stands both of which ended up not going back into place in the phone properly. I bought this stand and am thrilled. I put my phone in it and watch my videos. It is also easy to plug the phone in. You can place the phone vertical or horizonal. Plus the adjustability is nice, to go low or high. I put it on my bedside table and it takes up very little room. What more could you ask for. I highly recommend this stand. Bought the RED and love it. I set it up at my PC to hold my Moto Z Droid with the Otter Box. YES IT FITS WELL, AND DOESN'T TOPPLE OVER. Well made, sturdy, the charging cord fits, and it is adjustable for angles. Not too much as my phone is heavy, but works great for me. This is going to last for many years, it is that well made, and I am not hard on my stuff. I bought 2 of these, one for me and one for my Nephew. He likes his a lot as well. I also bought the Folding Lamicall for my Son for ease of packing as he Travels. Wish I had bought that one for me as well. Great stand! My LG phone heats up when charging so i was always prospering it up so air could circulate. This stand does that and more. You can put it in many positions and when on speaker phone i don't have to hold it! I can multi task! It's great . do you make them for I Pad minis? I use this stand many times a day for my phone. It's so helpful and easy to position. Even my 11-in tablet fits on the stand in its case. Inexpensive, sturdy, and attractive. Phone and tablet cables easily fit through stand. This is a perfect tablet holder. Recommended seller and goods.